The commercial block at the northeast corner of Main and Oak Streets in the Springfield neighborhood of Indian Orchard, around 1938-1939. Image courtesy of the Springfield Preservation Trust. Springfield’s Indian Orchard neighborhood was developed in the late 19th century as a factory village, and this intersection at the corner of Main and Oak Streets became its commercial center. The first significant business block, the three-story Wight & Chapman, was built in 1875 at the northwest corner of the intersection, and it was followed 30 years later by this building, which was completed in 1905 on the opposite side of Oak Street, at the northeast corner of the intersection. In 1886, Bengle purchased Chapman’s interest in the business and became its sole owner. 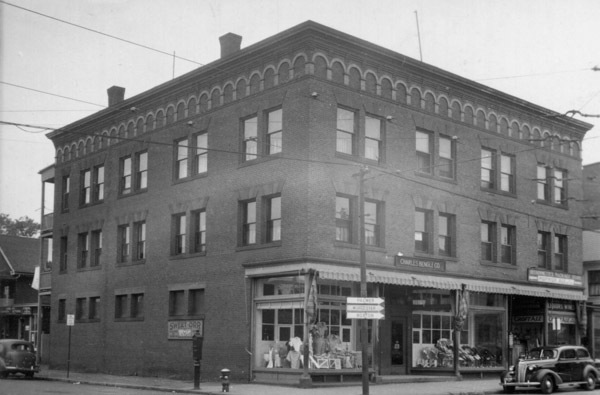 The store remained in the Wight & Chapman Block until 1905, when Bengle completed his new building across the street. His store occupied the storefront on the left side, and he ran it until his death in 1909. However, the business remained in the family for many years, and it thrived during the first half of the 20th century, drawing customers not only from Indian Orchard but also from the nearby towns of Ludlow and Wilbraham. The first photo, taken in the late 1930s, shows the sign for the “Charles Bengle Co.” above the left storefront. At the time, it was run by Charles’s son Adelard, who died in 1946 and left the store to his son, Victor. However, by this point the store was in decline, and it finally closed in 1952, more than 75 years after Charles Bengle first entered the retail clothing business. It was replaced in this storefront by a radio and television store, but subsequent tenants included an auto parts store and, today, a cabinetry store. Overall, despite changes in its use, the building itself has remained remarkably well-preserved. The storefronts have not been significantly changed since the first photo was taken, and the upper floors retain their decorative Classical Revival-style features. 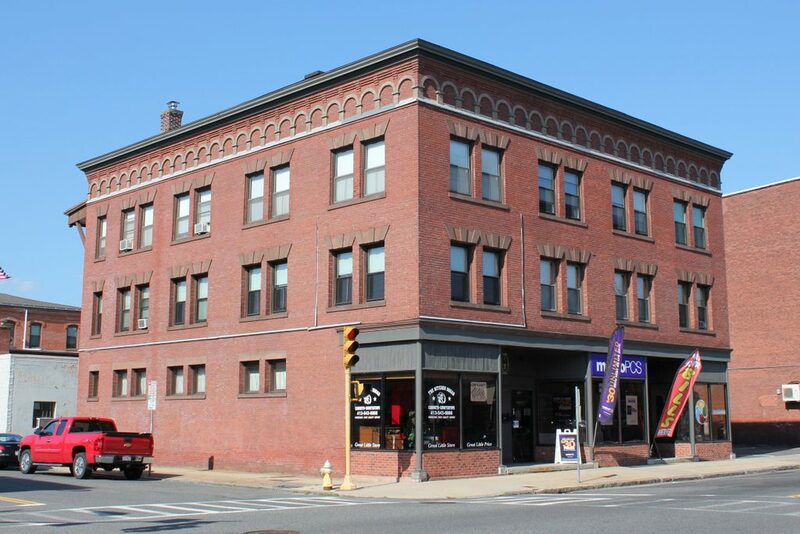 It is one of several historic business blocks that still stand here on this section of Main Street, including the Wight & Chapman Block and the nearby LaRiviere building, and today the center of Indian Orchard still retains much of its original late 19th and early 20th century appearance.